Last year, for the first time in our relatively short blog history, LG celebrated the turning of the year of PF awesomeness with a gift for himself and for me, Stanley Mayhem scorecard and yardage book wallets, which he reviewed in detail here: https://thepowerfade.com/2012/11/15/review-leather-scorecard-wallets/. After fully agreeing with LG’s analysis, it became apparent that this should be a yearly exercise for the PF–not only to review excellent equipment, but to support the artisans who make them. This year, I stumbled upon a tremendous offering from a friend of the PF, LaMont Mann. I’ve known LaMont Mann since he lovingly crafted my putter, which is reviewed here: https://thepowerfade.com/2011/05/02/review-sunset-beach-golf/. LaMont is one of the kindest and most humble people you will ever meet, but he is also one of the most talented in crafting putters. His custom and hand work has become a springboard for a great business. LaMont is capable of making things in the golf world that few can, and he offers his services at a reasonable price to those lucky enough to find him in a world where marketing often wins out over true craft. I’d recently noticed LaMont’s postings on his Facebook page about some new divot repair tools. His initial offerings were single-prong tools. While those appeared to be well-crafted and of tremendous quality, they did not pique my interest for the simple reason that I never have liked to use single-prong tools. I’m sure someone was in his ear telling him “you have to make these in a two-prong shape.” Well, he did. As you can see, these tools are custom milled, torched to perfection, and hand paint filled by LaMont himself. The cost was $86 for both tools with shipping included–certainly not inexpensive, but not as much as I would have expected for custom-made equipment. So, any downsides? Well, the answer to that is a “sort of.” These tools are really, really cool items–especially for someone who knows custom equipment and/or knows who LaMont is. For the casual golfer, the reaction might be “why did you pay so much for something that nice clubs give away for free?” Or “I bought one of those at the Tour Championship for $36 and it had the Tour Championship logo on it! That’s an absurd price!” I understand where those people are coming from. I think these are tremendous. The personal craftsmanship is there. They are milled steel, paint filled, and made just like I wanted. On the other hand, these are not performance golf tools; they are being used to fix pitch marks in the green. They don’t have to be perfectly balanced to strike a ball correctly or milled to tight tolerances to avoid defects. However, when I use my custom tool by LaMont, I’ll know that I have exactly what I want in my hands and that it is as good of a tool as I could’ve gotten. That alone will give me confidence not to think of the wrong things on the course. I’ve had a few recent additions/deletions from the bag for 2013. 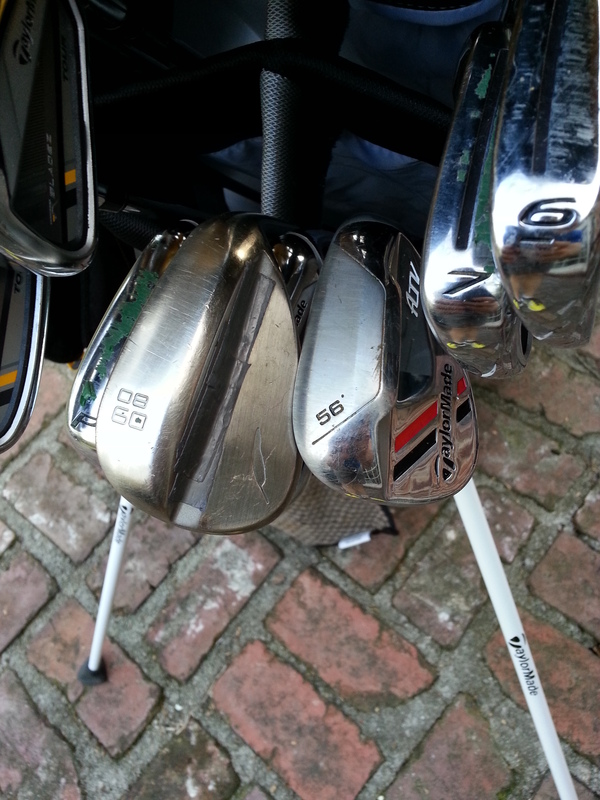 My bag has changed greatly from my prior WITB. I’ve come into a position of being able to purchase TaylorMade equipment, and that’s exactly what I’ve done. I still have my Adams XTD Super Fairway, I still have my Fourteen MT28v5 lob wedge, and I still have the world’s greatest putter, my Sunset Beach Ocean Isle crafted by LaMont Mann. Otherwise, the bag is very different. A few of them were undesired changes. For example, a caddy at East Lake lost my Mystery Valley towel along with several towels that LG gave me. I haven’t had a chance to make it back to MV to purchase another. 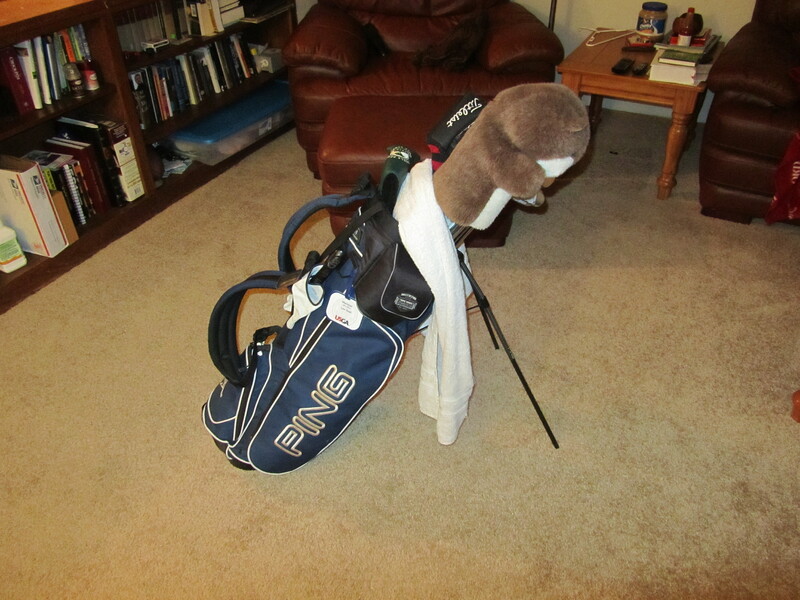 I haven’t yet transferred all paraphernalia from my old PING bag to my new RBZ bag, but it’s in progress. Some highlights of the new additions are below. 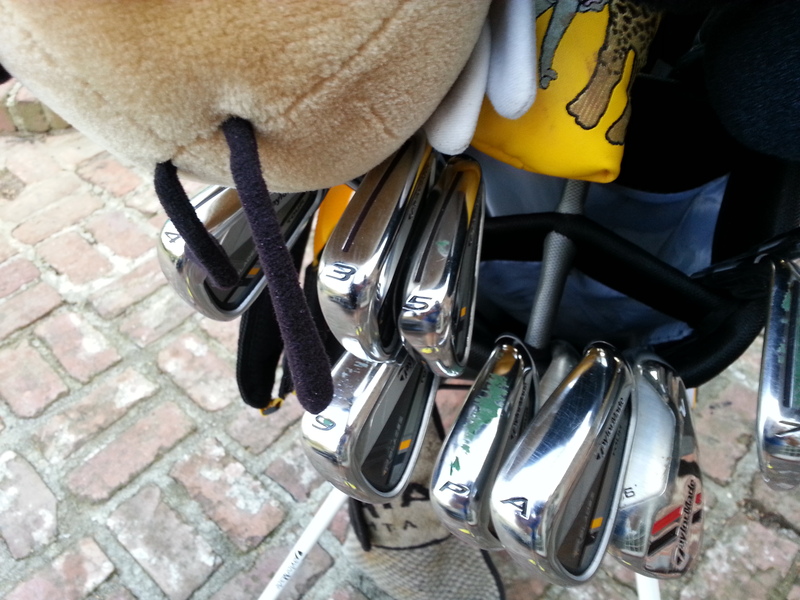 First, RocketBladez Tour irons. These are tremendous irons. I originally purchased my set 3-PW, but I had to buy an AW because I hit them too far. I am pushing 250 with the 3-iron. 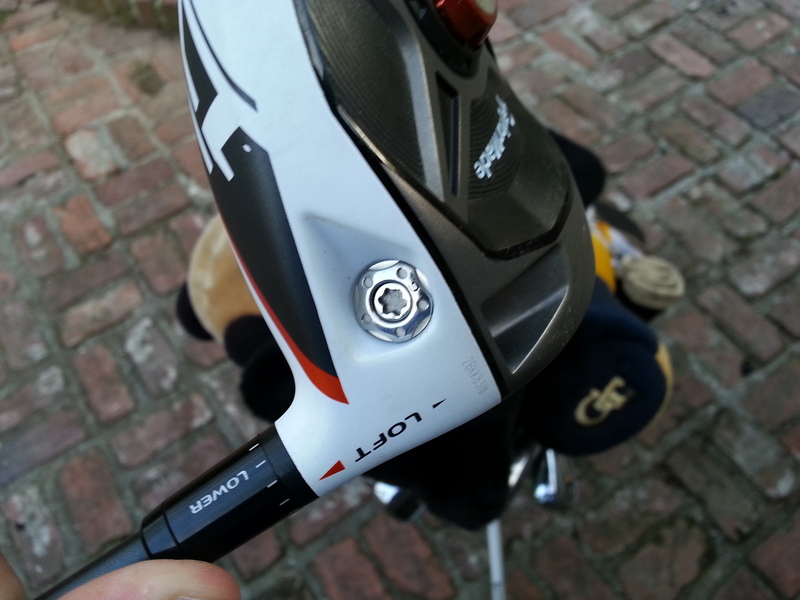 The slot technology really does improve the distance, but that’s not why I bought them. The more important part is that it improves the feel. The sweet spot is enormous on these–almost the size of a quarter. To a good golfer, the difference between nickle- and quarter-sized sweet spot is enormous. Perhaps that’s the reason so many pros got them. As you can see, I still have my MT28V5 lob wedge, but I’ve replaced the sand wedge after a few seasons and a restoration. I went with the TaylorMade ATV wedge in 56 degree bent 1 degree weak to 57 degree. This was the loft I had always played in my wedges going back to when I was 16 years old, so this just made sense. ATV’s sole flange is actually really good out of sand because it gives more bounce contact with the sand. Plus, they are naturally set up a little shorter and a little heavier than a standard wedge, which is what I do anyway, so it works out great. I have since changed the paint fill on the two stripes to yellow/yellow, but for the purposes of getting this uploaded and online, it’s on in black and red. 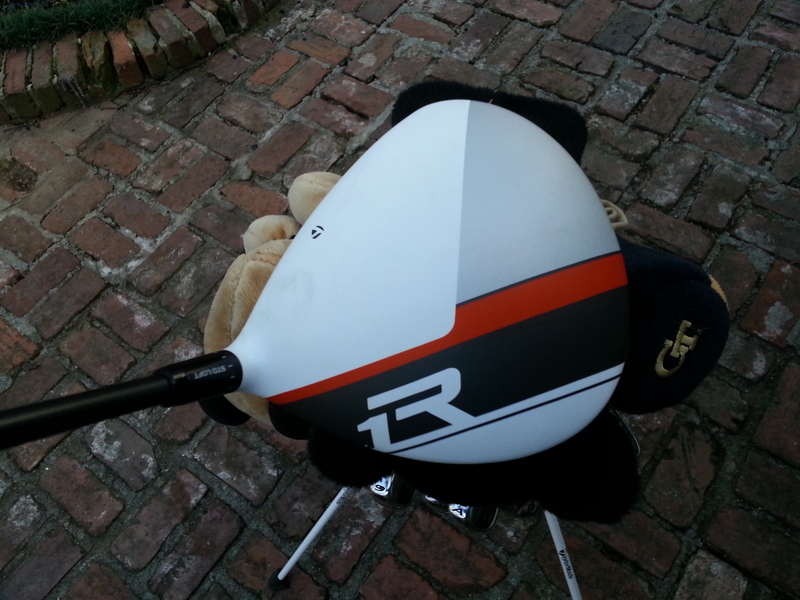 Now, the beauty–R1. This driver is a beast. First off, the customizability is a tremendous feature. For a better player especially, this works wonders. You go out to the range, hit it 20 times, tweak it, hit it again, tweak it again, and go over and over until you hit the flight you want. If you can find a few different shafts to try, even better. 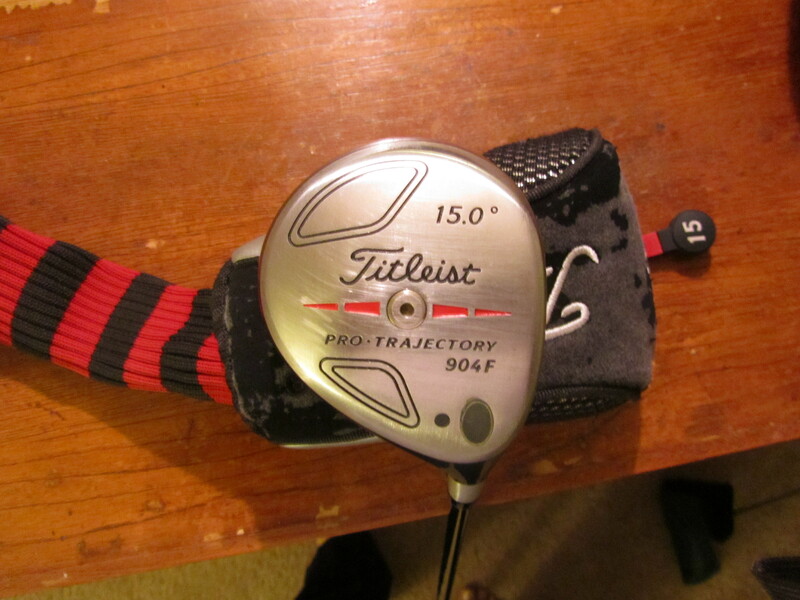 Mine is dialed in to 10.5 loft (higher than the 9 I used to use) with a TP shaft in it, a RIP Phenom in 65g. The original 55g RIP Phenom I felt was a bit too light. I also cut it down to 45″ from the original 45.5″, which is stock. To compensate for swingweight, I replaced the heel weight (1g) with a 6g screw-in weight. It really is a driver that I customized for me. Best part–if I ever find I don’t like it, I can change it. I think LG is going to work on a new shaft in his–we’ll see what he ends up with. This driver is a beast. It is every bit as long as my last driver, but I never seem to mishit it. Even the ones that don’t feel great are still long and around the fairway. I’m able to move the ball both ways but it doesn’t ever get out of control. I really like this driver, but that’s what TaylorMade has always done well. The pic below shows a full shot of my new bag. It’s got all the colors worthy of a JK bag. 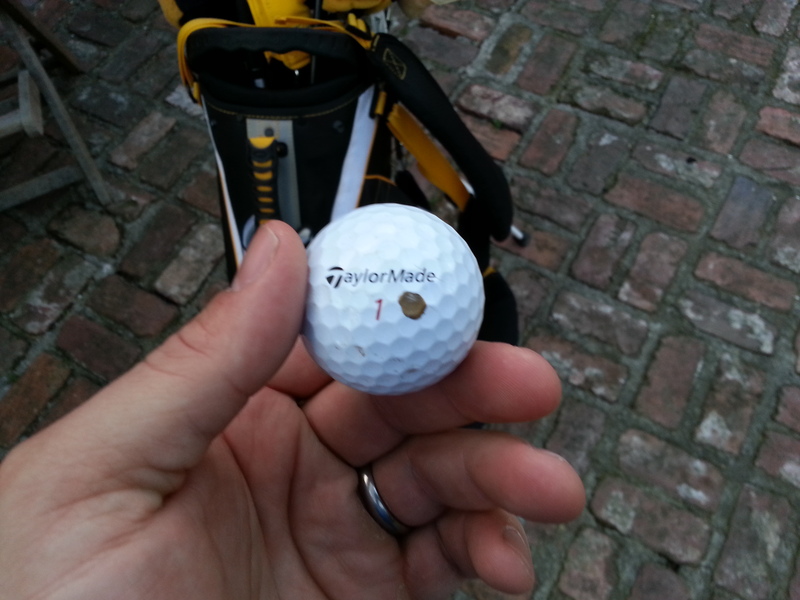 I’m now using TaylorMade Lethal golf balls, which work great. Maybe not quite as much spin as Pro-V1x, but it’s frankly been a good thing because I can’t seem to hit my driver anywhere other than exactly where I want to. The ball feels great on and around the greens. As you can see, I still have my gold markings commemorating Georgia Tech. I recently found new Sharpie markers in an Office Depot, as well. It seems Sharpie has finally re-released the gold, silver, and copper colored Sharpies (not paint markers) again. Great news for me, as I was down to my last gold Sharpie. That’s it. As you can see, a lot has changed, but a lot remains the same. Most of the inner workings of my golf gear has not changed–the ball liner, the scorecard cover from LG (thanks bud), the range finder, etc. However, the influence of a good deal is evident–I definitely am getting great pricing on TaylorMade gear. But it should be noted–I have elected to continue to play equipment that works well for me (which is why I still have some non-TaylorMade equipment). With the new additions–especially the newer and better driver–I’m striking the ball well and looking forward to a good season. The first look is of the entire bag. What immediately stands out is the color yellow. 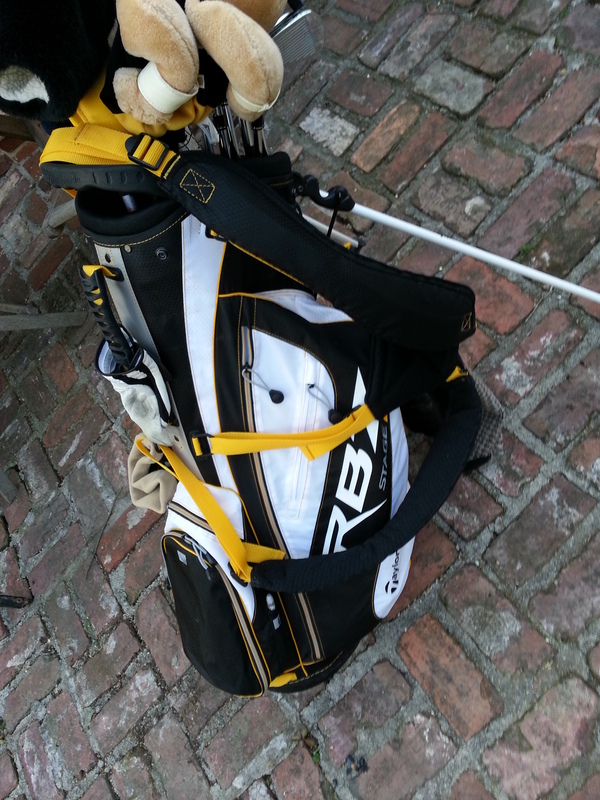 To accommodate my Georgia Tech Yellow Jackets, I’ve bought yellow golf bags over the years. Slowly, I’ve continued to include yellow colors in various aspects of the bag until virtually everything in the bag now has something yellow associated with it. The towel here is for Mystery Valley Golf Course in Stone Mountain/Lithonia, Georgia. I grew up playing this course, and this towel goes with me wherever my bag goes. It’s a reminder of where I learned to play the game and, more importantly, how I learned to play the game. Mystery Valley is the subject of a PF review, https://thepowerfade.com/2011/07/25/review-mystery-valley-golf-course-lithonia-ga/. I recently decided that I wasn’t good enough to play blades anymore. Too much inconsistent contact (due to too much inconsistent practice) means cavities were the way to go. 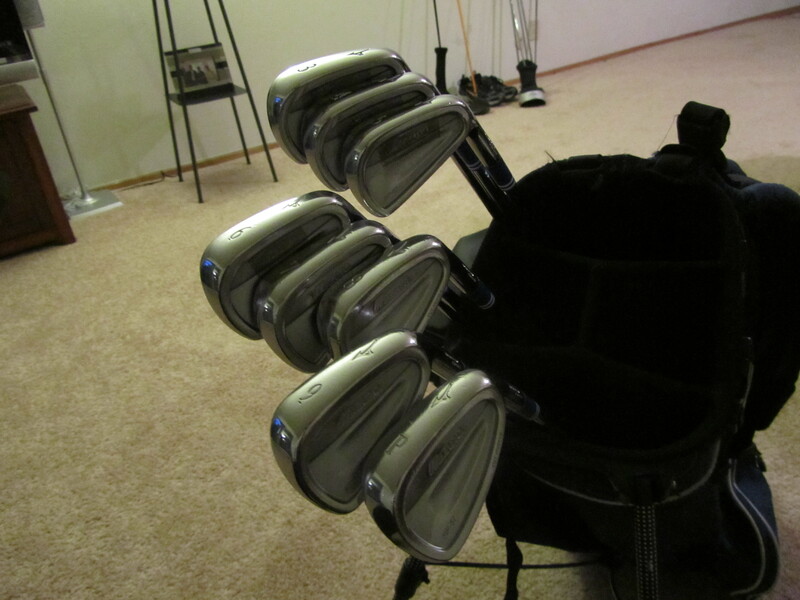 I picked up these Mizuno MP 63 irons near the end of last year. They’re great. Diamond muscle cavities provide a good touch and workability along with a low COG, but the cavities edges create perimeter weighting, helping with forgiveness on off-center hits (THANK YOU!). 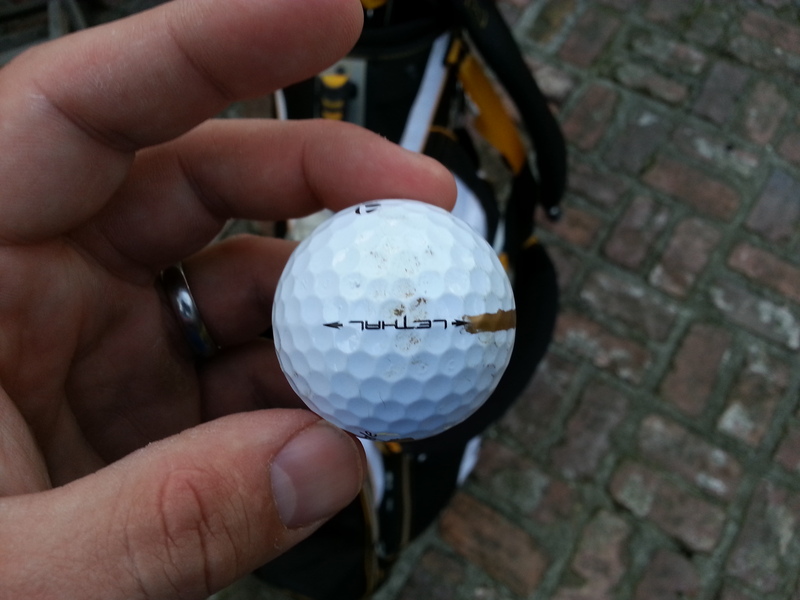 I would recommend staying away from the KBS Tour iron shafts, though. They felt mushier and less certain, to me, than the X100s that I am now playing in them. I swingweighted them to D4-D5 and put on custom ferrules (which are seen in another pic). Nice to have a set that is truly my own. I purchased this MP 53 3-iron from a member at GolfWRX. I found out later when building it into its current form that the head weight is a little light of standard due to it being designed as a “B” head. Mizuno is the only company (that I am aware of) that has two production lines: one is for standard weight heads for standard length clubs, one is for long club for taller players. When the clubs are built to 1 inch or more over standard, the head weight needs to come down to keep the swingweight relatively the same. Because I play my irons at standard, I have a tip plug and lead tape on the head to get the weight where I like it (playing around D4-D5). 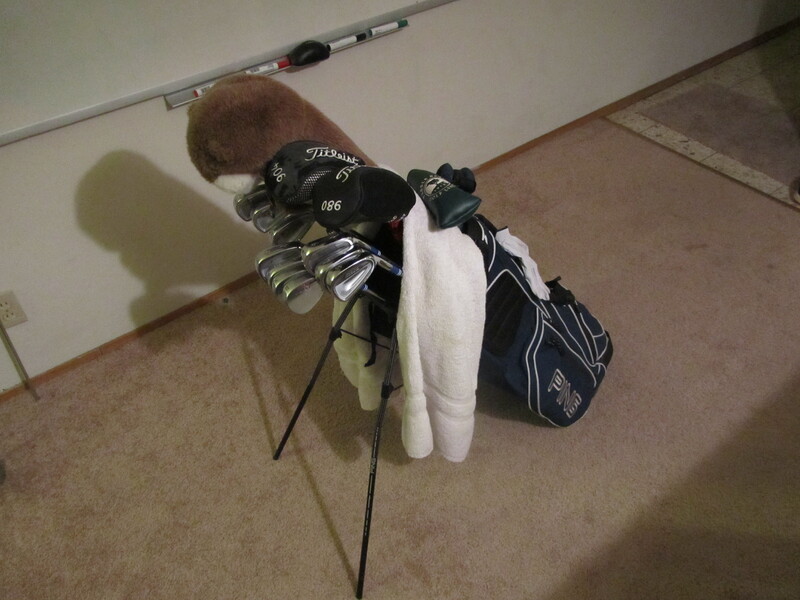 Another view of the bag shows the various towels and headcovers. LG was kind enough to get me some yellow and white towels, and I keep a black one on the bag for when I really get a lot of dirt on the club and don’t want to dirty up my nice white towels. There are four headcovers on my bag, none of which are standard. One says “GT” for Georgia Tech and has some logos on it. Another is Buzz, the GT mascot. These two headcovers protect my fairway woods. A black panther protects my driver. The panther is the mascot of Georgia State University, where I got my graduate degree. I was unable to find any blue or purple panther headcover, though (both colors used by the university at some point, oddly enough), so I went with black. The last is the cover to protect my putter, which is a custom made by Delila. More seen of that in later pictures. Pure Pro grips are tremendous. I’ve been meaning to do a review on these, but they are sturdier than Tour Velvet while also being tackier to promote traction. I couldn’t be happier with them, and the yellow was a bonus. Custom yellow ferrules from eBay. Yes, it’s a little gawdy (or maybe a lot), but I’m the only person I’ve seen that has custom yellow ferrules. There’s something to be said about that. Another look at the various headcovers. Chris Jordan of Sunset Beach was nice enough to get me a yellow putter grip recently. It works great. I had 27 putts in my last 18 hole round. Below is the headcover by DelilaH. A full review of Delila and her process is at https://thepowerfade.com/2011/12/07/review-club-covers-by-delilah/. The long story short, I wanted a custom cover to match my bag and to remember my kids when I’m on the course. This was the best I could’ve ever dreamed of. Another look at the Panther. Growl. LG and I simultaneously (or close thereto) have shifted between various drivers over the last few years. First, we had SMT drivers (review at https://thepowerfade.com/2011/01/24/review-smt-golf/). We experienced some problems with our SMT drivers that we did not anticipate, so LG first switched. 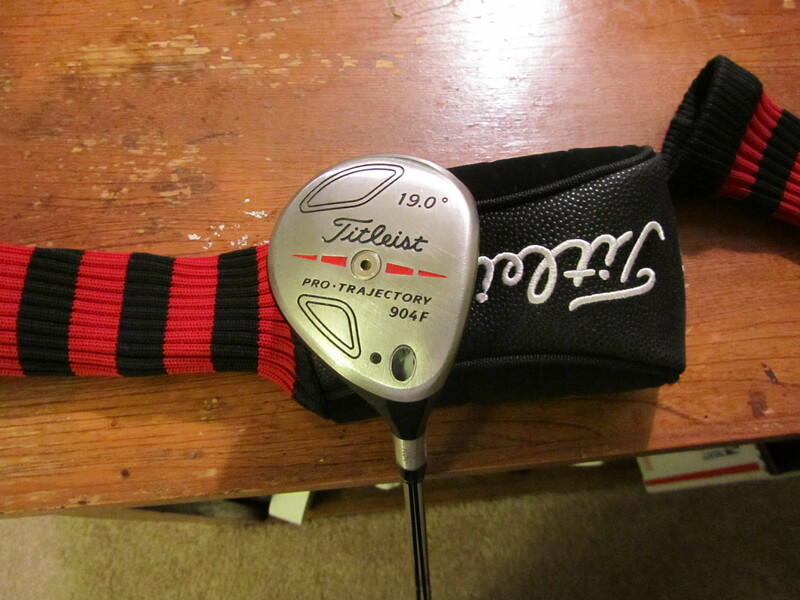 He was looking at the Titleist 910 drivers and decided to save his money and buy a 909D2, which is basically the same thing but without an adjustable hosel. I followed suit shortly after, buying a 909D3. 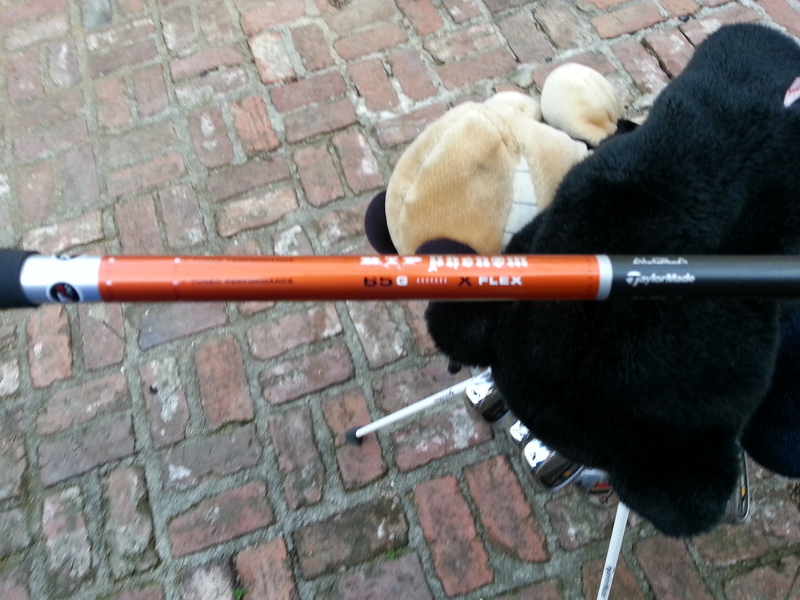 I put in a V2 Tour Flight shaft, but it was too low, and I did not like my dispersion. So, I found a decent price on a Japan-issued prototype Diamana Whiteboard 73x5ct. I had previously played 80g shafts and 60g shafts, but they never felt right. The Whiteboard, at around 70g, was right on. I put in a Harrison Shotmaker in E flex, and my drives have been long, straight, and accurate ever since. Nothing is a panacea, and I still have occasional bad shots, but this setup is working very well for me. 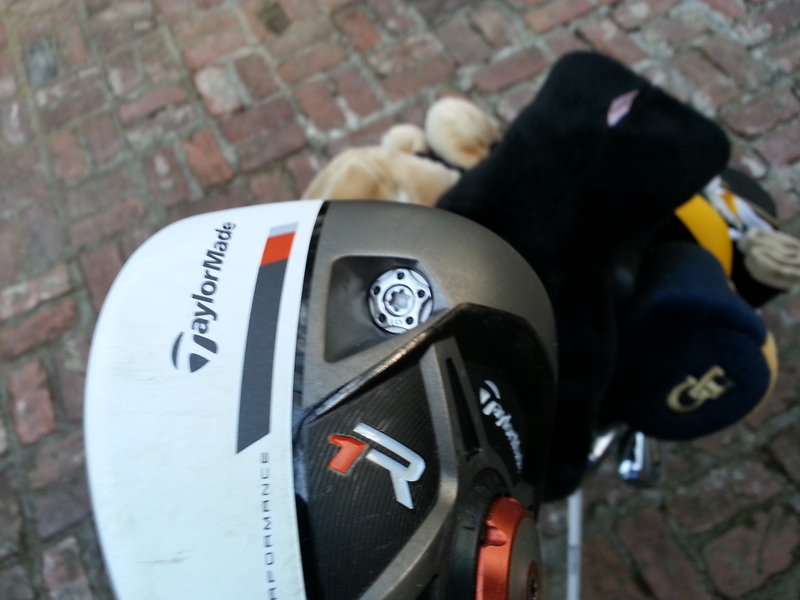 Below is the oldest club in my bag and its cousin. The 904f 17 degree fairway wood was a club I bought while I was in college. I had played a 2-iron for a long time, but I decided it was getting too difficult to hit. Plus, I wanted to add an extra wedge, and carrying a 3-wood and a 2-iron could be eliminated if I played a 4-wood. So, I traded in my old 3-wood and got the 904f. It has seen a lot of bag changes (from 962s to MP14s to MP67s to MP32s to KZG ZOs and now MP63s, and that’s just the irons!). It got so scratched and dirtied that I decided to repaint it. It’s still the same tremendous golf club it was for me many years ago. The 13 degree I bought within the last two years. LG was in Atlanta more than a year ago and hit my 904f 17 degree. He liked it so much that he started looking for his own 904f. We found someone willing to sell a 15 degree, 13 degree, and 19 degree, so I bought all of them, kept the 13 for myself, and sent the 15 and 19 to LG. The 13 will be coming out of the bag soon in favor of an Adams XTD Super Fairway (pics to come later), but my bag is still accurate as of now. Oh, and an instructional for repainting the 17 degree fairway wood is at https://thepowerfade.com/2010/12/06/repainting-a-club-redux/9/, which includes a link to the original repainting thread. The Bushnell Tour V2 laser, approved for tournament play. What a great device. The scorecard holder below was a gift from LG (very kind, and thank you). It goes with me everywhere and is very helpful, especially on summer days in Georgia when I have a tendency to sweat through my scorecards. A review of these will be forthcoming, but know that this is a great product and is just the signature touch I needed to complete my bag. 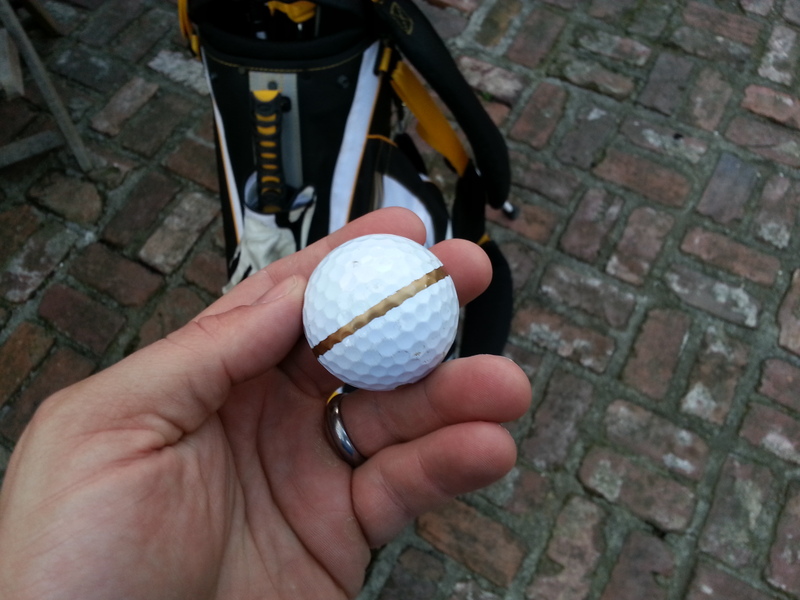 In a nod to Georgia Tech, I mark my golf ball with a gold dot and gold line (considering the colors are old gold and white). I do it while I can, until I run out of the markers I have, then I’ll have to find something else to do. These markers are out of production now. They still make the silver metallic ones, but Sharpie does not make gold anymore. I’m told they once made copper too, but those are the rarest by far. These still come up on eBay from time to time, but they aren’t cheap typically. I lucked out and bought 6 about two years ago for under $20. I still have 3 remaining, so hopefully they’ll last until I can find more. Sharpie does make paint markers, but that’s not the same as a true Sharpie. The color is great, and the markings wear off slowly over the course of a round. While this seems bothersome, it’s actually good because you can remark at the end of the round and, as long as you haven’t significantly dinged your golf ball, it feels like a new ball! I’ve been very happy with these. Finally, a bag tag from Glen Abbey. For those that don’t know Glen Abbey, it’s a championship course that was the home of the Bell Canadian Open for many years. Now, the Canadian Open shifts from one site to another, but the course is still in championship shape. Glen Abbey was one of the first (if not the first) championship courses I ever played. It’s loaded with history of great players doing spectacular things there. Some memorable moments are seen in the video clip below, most notably, Tiger Woods’s 6-iron shot out of the bunker on 18. Yet another moment (I believe from the same tournament) but lesser-known was Tiger’s charge to make the cut. After shooting a 39 on the back 9 of round 1 on Thursday, (scorecards here: http://www.pgatour.com/r/tiger.victoryroom.win24/index.html), Tiger was in jeopardy of missing the cut. Tiger finished the back 9 on Friday (round 2) with birdie, eagle, birdie, eagle–going 6-under for the last four holes to shoot 32 on the par 37 back 9 to make the cut and, eventually, to win. The Glen Abbey bag tag is a reminder to me never to give up and, when all else fails, to be aggresive and to trust my instincts. So that’s it. There are some other nuances, but I could waste all day blathering on about mindless stuff that has some meaning to me but, invariably, doesn’t have meaning to someone else. Leave a comment if you feel, and thanks for looking. 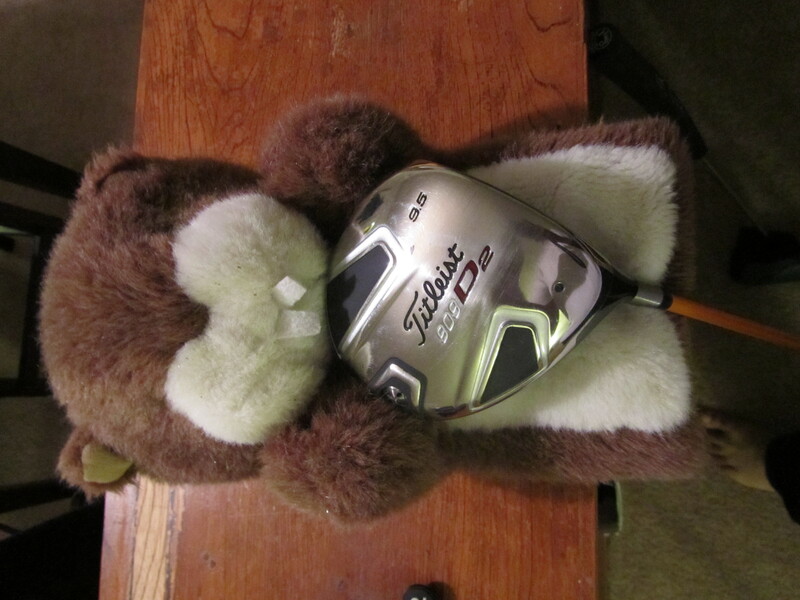 Also, the pictures below were taken near the end of last year to try to do a WITB then, but…clearly…I didn’t. As you can see, not a lot has changed, but there are some differences. Many of these are now backups to my current set. Enjoy. It may come as a surprise to our readers, but I often spend some of the quiet time of my day reading golf magazines. One feature that tends to draw my attention is the “what’s in the bag” piece that invariably makes its way into every issue. This page tends to turn into an ad for whatever label happened to be sponsoring the winner from the previous week. Occasionally though, these segments provide a little nugget of information about the player that you would otherwise never come across. Some pros only play a certain number golf ball. Some throw out a ball after it makes a bogey. Some only mark their ball with a certain color pen. These little nuggets help us learn a little more about the pro behind the brand and makes them appear more human. Occasionally there is an equipment note that changes the way that I play the game. For example, one pro said that he carries a couple of extra pairs of socks with him. When he’s having a bad day he’ll switch his socks at the turn. This tip blew my mind because I never thought that something that simple could impact the way that I was playing on a given day. I tried this tip the very next I went out and let me tell you. It’s awesome. Whenever I play I always throw an extra pair of socks in the bag now to switch even if I’m having a good day. With that background, I hope you find something interesting or useful as we look through all the junk that’s in my golf bag. 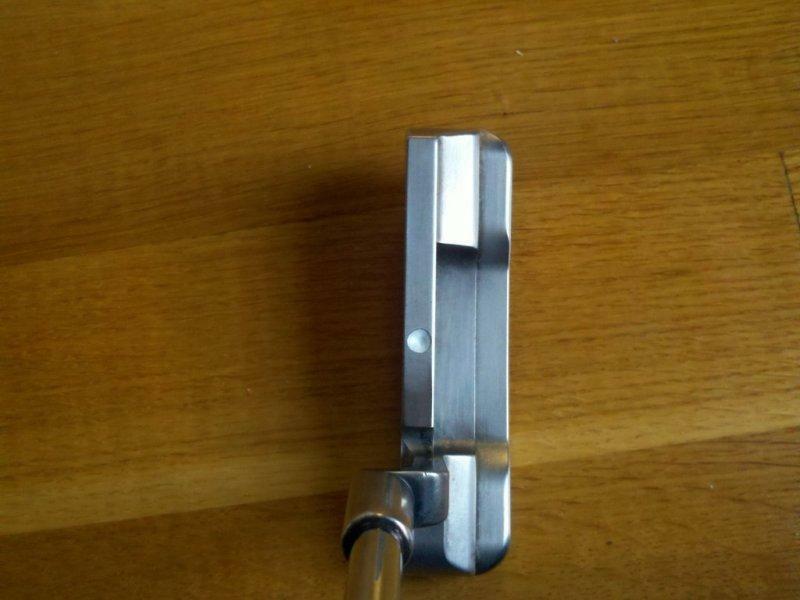 My putter is a 35″ Scotty Cameron California Series (Monterey). All standard specs with a pingman grip. 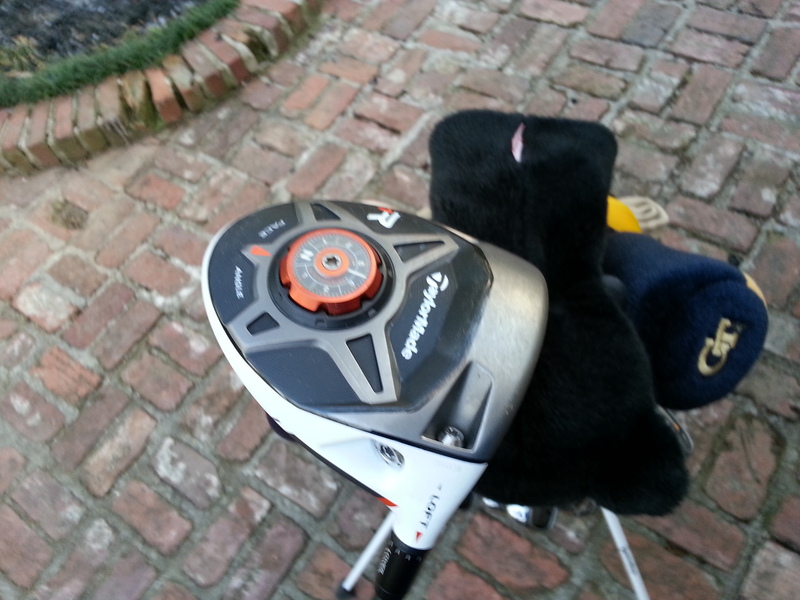 I bought this headcover during my first trip to Pebble with JK. We played Spyglass Hill and Spanish Bay when we were working together as summer associates. Though we didn’t end up playing Pebble then, we did talk about when we’d finally make it out there during a little lunch at the Tap Room. I’d highly recommend their house ale. (tastes like Bass). 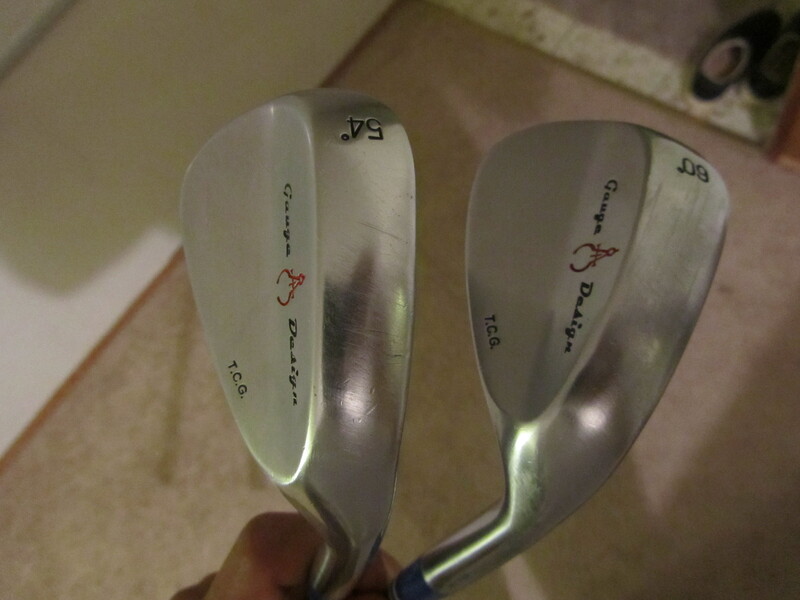 My wedges are two of my favorite eBay purchases. I won’t tell you how good a deal these were, but suffice it to say, I’ll never see another one like it. All of my irons are 1.25″ over standard length (including wedges) with jumbo Lamkin tortion control grips. These wedges meet the condition of competition requirement and are two of the best clubs I’ve ever owned. 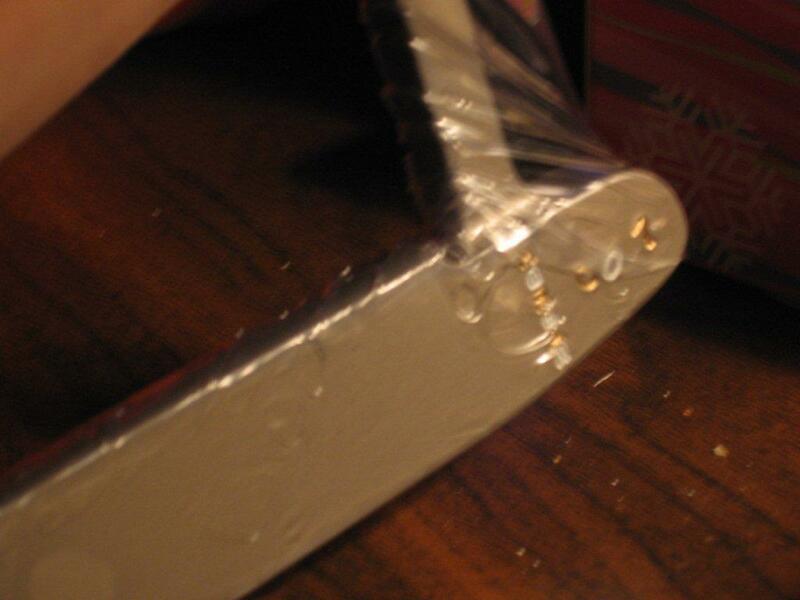 Nothing beats a well-made forged wedge. I built these myself with old S300 shafts from my previous iron set. 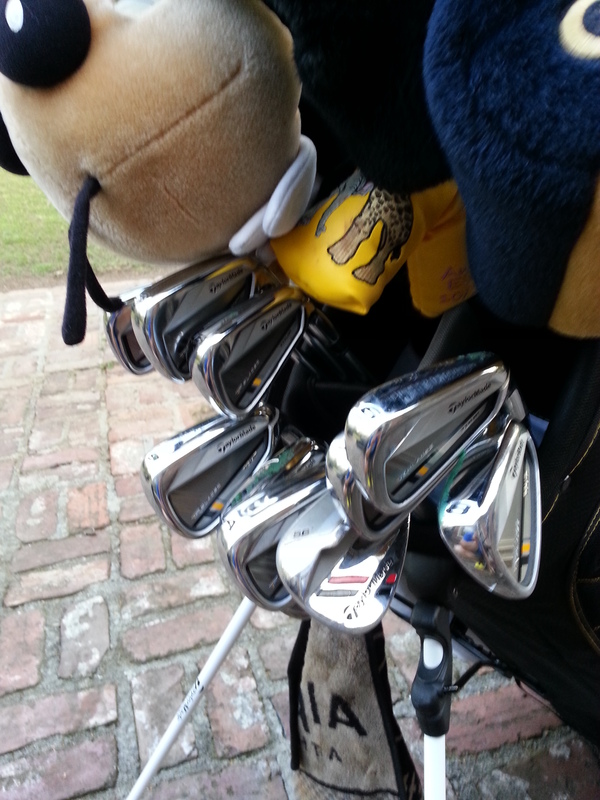 My irons are Mizuno MP-57s. These were actually the first set of Mizuno irons I ever purchased. I bought a set of MP-32s from JK that were an inch over standard to try out, but decided I’d like to rebuild these 57s after having played the 32s for a few months. My main reason for the switch back was that these irons were in such good condition that it felt like a waste to have them in the closet. The 32s had enough wear on them to justify getting rid of them before they got any worse. I ended up purchasing some X-200 shafts on eBay for about $40 and rebuilding these to my exact specifications. I also purchased some custom Navy and White ferrules to spruce up my irons. Go Eagles! My Titleist 904F 3 and 5 woods are two of the best clubs I’ve ever owned. It is a testament to how great these clubs are that they came out in 2004 and still find homes in the bags of several professionals. Fairway woods tend draw emotional attachment for golfers more than any other club, and these make me understand why. If I must find the fairway, I grab my 15* 3W and swing as hard as I can. Both of these have X-100 steel shafts. 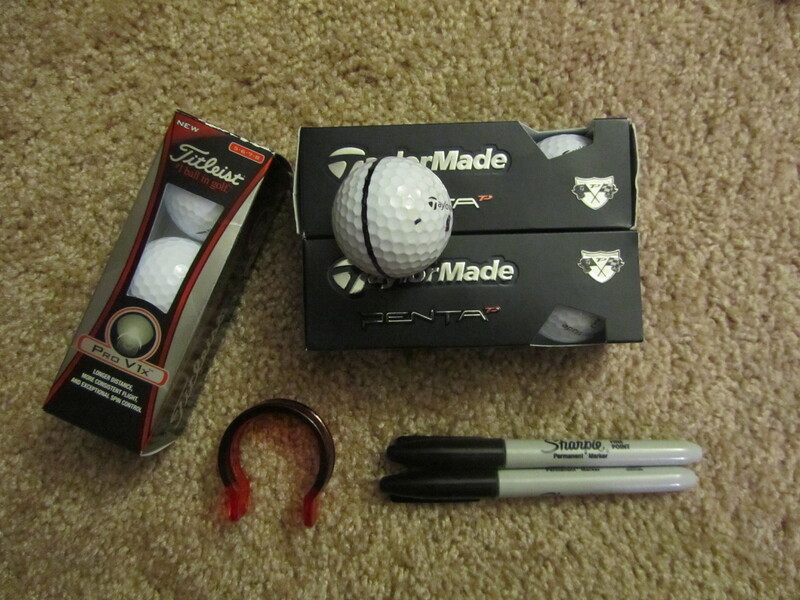 As far as balls, I currently have TaylorMade Penta and Titleist Pro V1x. Like certain pros, there are numbers that I prefer to play to others. When I have balls with less than favorable numbers, I’ll mark them out. I also put a line around the ball to help out with my putting. This little device has probably saved me more strokes than any piece of equipment. For those of you having putting issues, I recommend at least trying this on the practice green as it will give you instant feedback on the quality of your contact with the flat stick. Thoughts, JK? Now, for the rest of the bag! Camera – Unfortunately I couldn’t take a picture of my digital camera (obviously), but this little puppy goes with me whenever I go to a new course so I can do my best to report my thoughts in pictures to the fine people that read thepowerfade. I am occasionally so lucky as to have a travelling photographer join me to take pictures on these golf related excursions. Tees – the red one has actually been in my bag for quite some time. For some reason I refuse to use this tee. 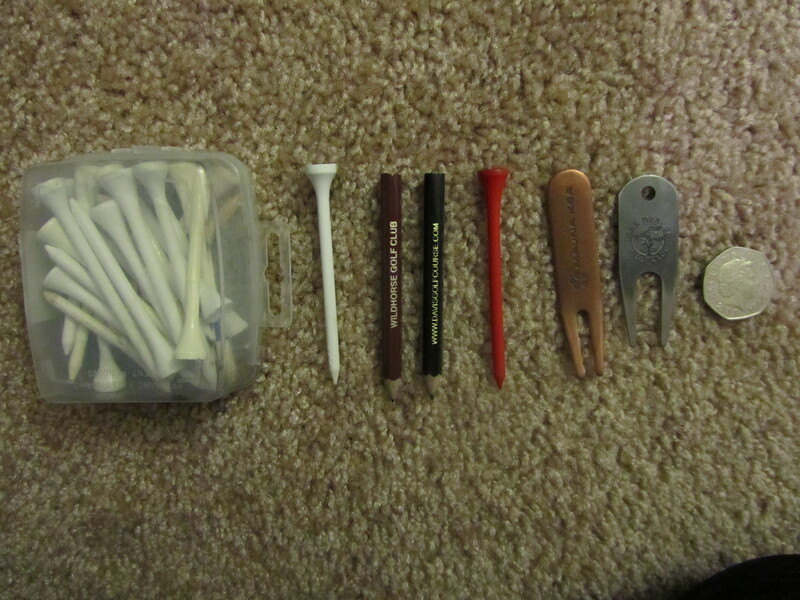 It may or may not bring me good luck, but mostly I think I’m just used to seeing it in the box of tees. Pencils from my two courses in Davis: The Davis Municipal and Wildhorse. These two courses are where I learned the game and have had the vast majority of my golf milestones. I still remember my first birdie at the 7th hole at Davis Muni. a 101-yard nine iron to 12 feet followed by a smoothly struck putt right into the center of the cup. I still have that rock flight lying around somewhere as well..
Divot tools – one from Mauna Kea that was a very special present, and the other was the first item I ever found on a golf course. I found this Lake Merced divot tool on the 18th hole at Davis muni while I was playing my first tournament – the Yolo County open. I still remember shooting a 78-88 in the third flight on the par 67 layout. Ball mark – a 50 pence piece that I picked up on my trip to the UK with my little brother. Its always nice to have a positive thought while you’re putting, and that trip is one of my better ones. 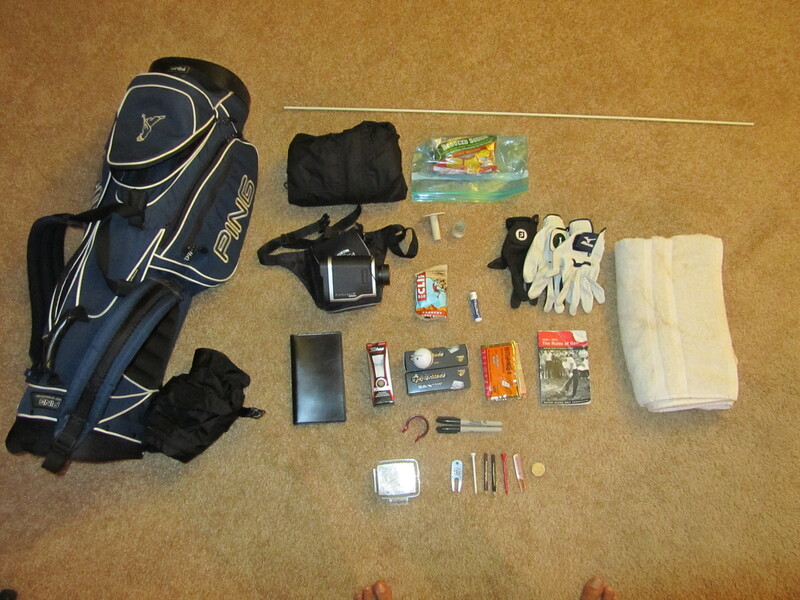 I used to think I kept things simple, but now that I’ve had a little time to reflect on what I chose to carry with me on every round, I’m amazed by how much each item reflects some part of my personality. JK, what’s in your bag? 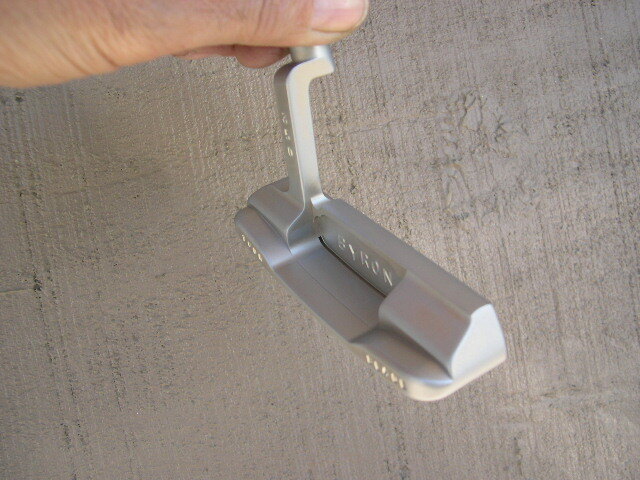 Today’s post reviews custom putter maker Sunset Beach Golf Company (ssbeachgolf.com). We have reviewed other custom putter makers in the past (e.g., thepowerfade.wordpress.com/2011/02/28/review-byron-morgan-california-flatsticks) and will try to keep our remarks in concert with the others. 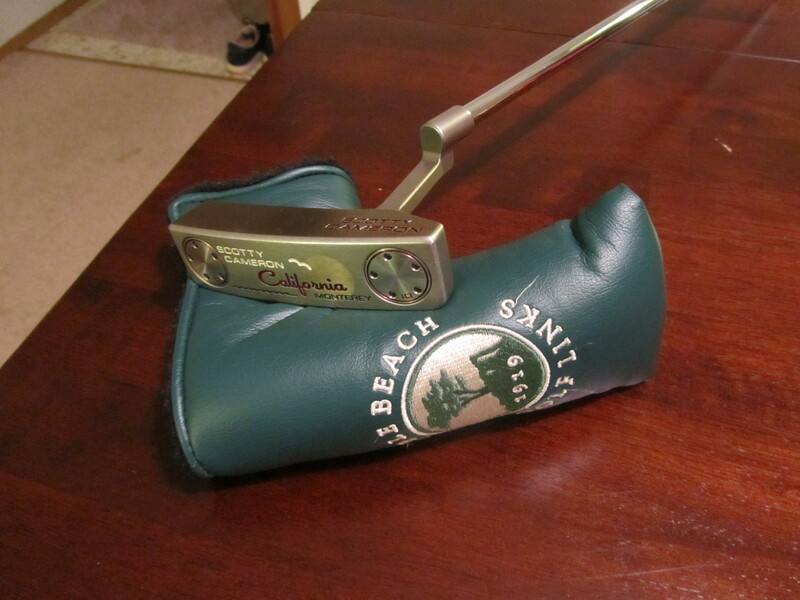 I first learned about Sunset Beach Golf while searching for custom putter makers online. Amidst Byron Morgan, Slighter, Piretti, Palombi, C&L/350 Milled, and others, Sunset Beach came to my attention. It happened that the company was running a special price on some of the marquee putters, so I contacted them about a quote. One of things I love most about dealing with small golf companies is the personal attention that you receive. If you want to buy a Rossa or Cameron putter, you have to go to Golfsmith or Edwin Watts and pick up what they have on the rack. When I contacted Chris Jordan (president and owner of SSB), I received several personal emails from Chris attempting to set up a phone conversation. When we were able to talk, Chris spent a good hour (maybe more) talking with me about his company, what his goal was in creating the company, and how SSB could meet my needs. Originally, I was on the fence about whether SSB would give me something I really wanted, but the phone conversation with the president of the company made me confident that my concerns would be addressed. 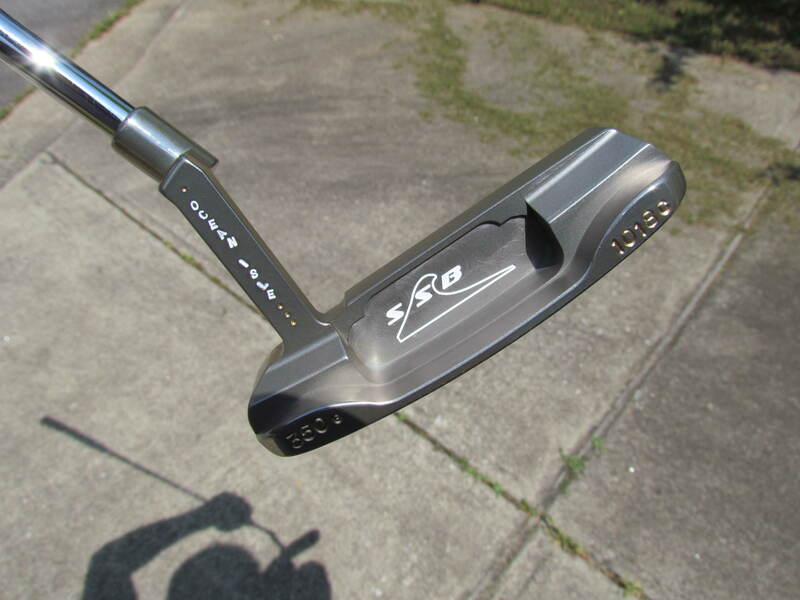 Sunset Beach Golf is a company started by Chris Jordan–former mini-tour player–to create custom putters at reasonable prices. Chris and I had a good conversation about a putter we both loved and enjoyed, the Newport Beach. Back in the day when balata golf balls were king, the Newport Beach was a great putter–responsive, soft, a true gem. However, as the Pro-V1 emerged as the dominant golf ball, the Newport Beach lost its remarkable feel. Chris Jordan started making his own putters to bring back the feel he once had with the Newport Beach even when using a modern golf ball. What emerged was a company dedicated to custom work. After teaming with LaMont Mann (of MannKrafted golf, mannkrafted.com), Sunset Beach was born. Sunset Beach offers a variety of standard head styles that can be shaped and ground to exact weight, shape, and look. The standard head shapes are offered with any variety of neck styles–in Chris’s terms, “any neck you can think of, we can do it.” The company offers a number of custom finishes and platings, including colored polymer platings, which offer the maintenance of stainless steel with the feel of carbon steel. In addition to the standard offerings, Sunset Beach can create custom milled or handmade putters as well in virtually any shape or style imaginable. Sunset Beach also offers custom stamping options. My SSB was an attempt to create the Newport Beach in a heavier weight head. 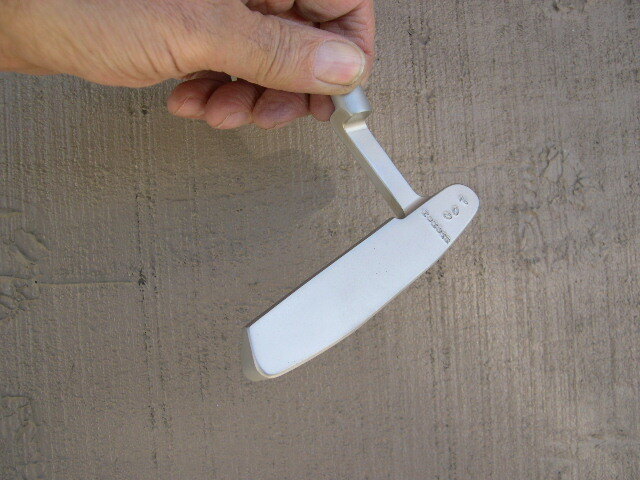 The Newport Beach is a 330-gram putter–I wanted the same putter in 350 grams. After filling out an order form, I provided Chris with a map of some stamping options. 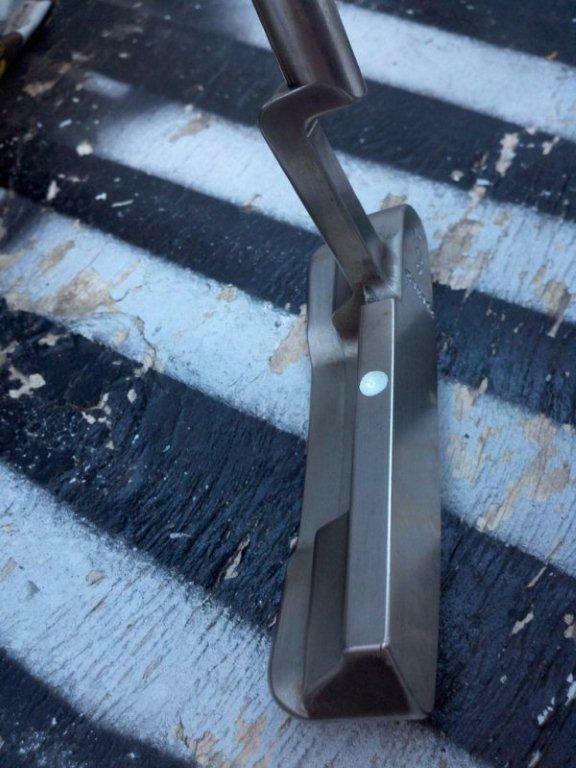 We discussed finishes, grind options, weight options, face milling patterns, and colors for stampings. What came out was one of the most beautiful putters I’ve ever seen. Sunset Beach offers customization options just like Byron Morgan, who we reviewed earlier. However, what is great about Sunset Beach is that the cost is minimal when compared to Byron. Chris Jordan talked to me about a custom offering that he had quoted for a customer. When he made his quote, the customer stated “you’re cost is 1/3 less than everyone else I’ve talked to.” Moreover, what you get is a truly custom option. Literally ANYTHING you can think of, Chris and LaMont can create it. Moreover, they’re super guys to deal with. They both kept me well-informed on the progress of my custom putter, and, although there were some delays due to unforeseen circumstances, I was never without information about what was going on with my putter. I simply cannot say enough good things about Sunset Beach. So, how about the quality? Well, the inaugural round happened to be my first ever round at East Lake Golf Club (site of the Tour Championship). I rolled almost 120 feet of putts, taking just 29 putts to shoot a one-under par, 71. This putter is in my bag for good. We’ve had some questions come up recently that we thought would be helpful to answer in the body of this post rather than in the comments. First, SSB putters are made in the USA. This was one of Chris Jordan’s major goals, as he’s stated to me several times. Initially, they made some heads in China because they couldn’t get a good enough price from a US supplier, but they have since increased volumes and found a US shop that will machine for a reasonable price. Contrary to popular belief, very few putter makes–even custom putter makers–make each and every putter by themselves in their own machine shops. Most outsource the raw machining and perform custom operations, including finishing, stamping, one-off milling (like my sound slot above), welding, making sight lines or dots, and grinding to weight. Even Byron Morgan does pretty much all of the finish work in his shop, but he doesn’t mill most of the putters he makes. Some putters made by LaMont, Byron, and Slighter are truly “hand made” in that they personally performed each and every step of the milling. This is not the case for most putters. However, it does not decrease at all how “custom” the putter you get from SSB is. Additionally, it should be noted that LaMont is one of Byron’s biggest fans. None of this post is intended to suggest any slight toward Byron–he makes incredible pieces. In fact, Byron started LaMont on this career, to the point of even supplying LaMont with unfinished anser-style heads so that LaMont could offer that line. 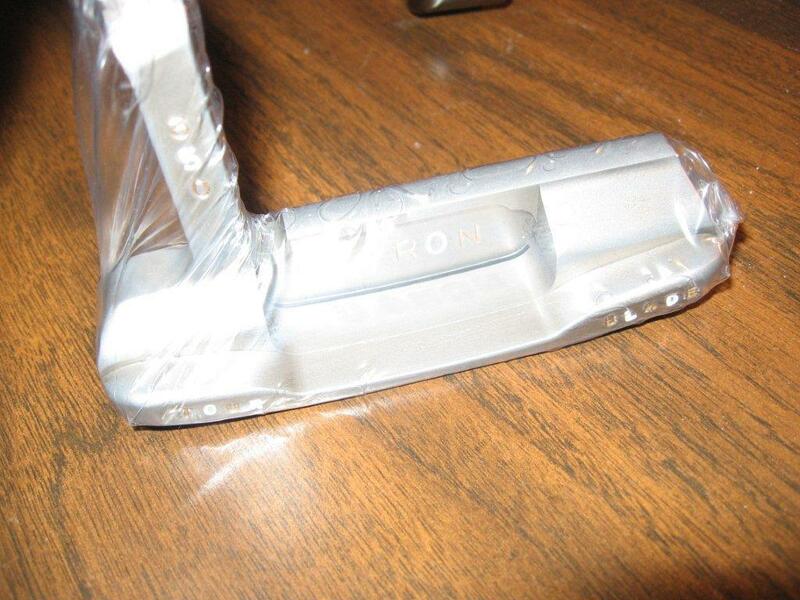 However, with SSB, the value for the price is every bit as good as a Byron putter. LaMont’s work is very, very high quality–if you haven’t seen his recent customs on facebook, you’re missing out. And what Sunset Beach offers in the way of customization is an excellent option for someone who wants a custom made putter without breaking his bank account. 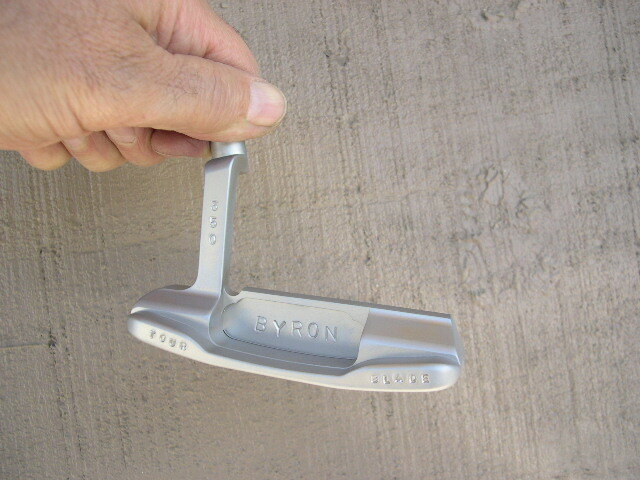 I recently had the pleasure of discovering one of the best finds of my golfing career: Byron Morgan putters. LG did a cursory POTW several months back when he got his first Byron, but this post aims to give a little more information. 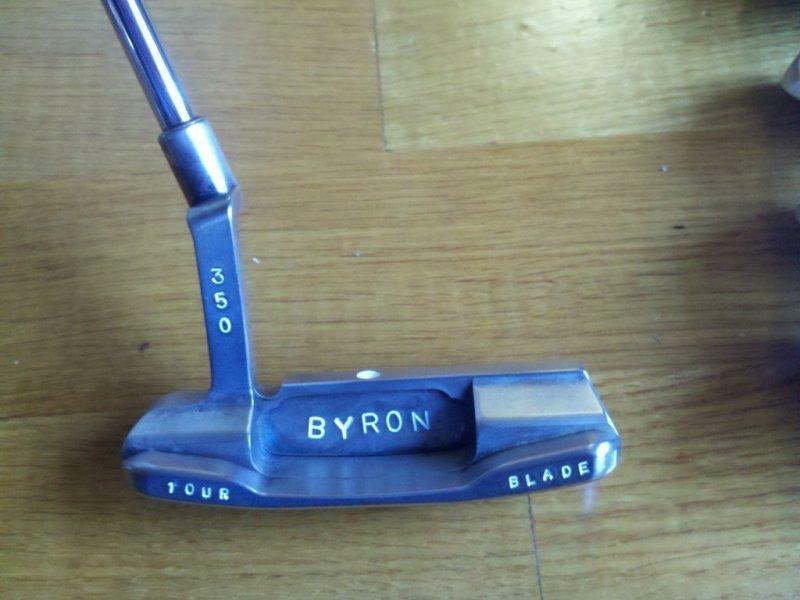 Byron Morgan is a putter maker out of Huntington Beach, California. He is famous among golf equipment aficionados for his custom-made putter designs. If you own a Byron Morgan, chances are no one in the world will own a putter that is exactly like yours. Although he does make production runs, they typically end at 25 or so putters maximum, and his custom options allow him to create for his customers a truly one-of-a-kind piece of artwork. and, the 007, which looks like something between the previous two. Byron also makes other models (the Channel Island, Bombora, and others), and is willing to provide different neck options above and beyond the standard plumber’s neck of his options. There is no “Off-The-Rack” Byron Morgan Flatstick. 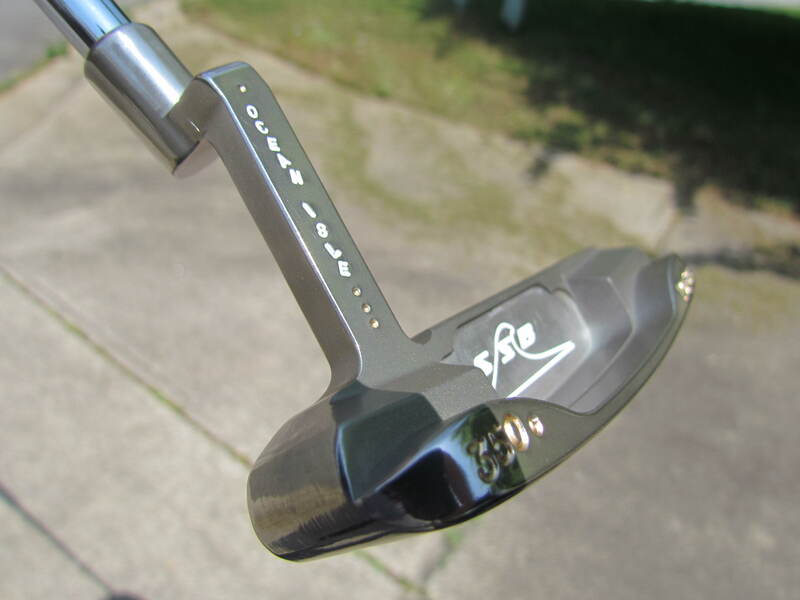 And, unless specified otherwise, Byron’s putters come with his unique “twilight zone” milled face. Byron offers a wide variety of material, finish, and stamping options in addition to his other customizable features. You can purchase a sound-slotted terryllium copper 007 with a slant neck and your name stamped on the toe in a polished finish at 350 grams; you can order a stainless steel DH-89 with blue oil flame finish and a flow neck with a raised sight dot and a stamp on the bumpers that says “drop” and “bombs”; you can get a center shafted 006 in carbon steel with a lightning bolt striking a four-leaf clover stamped on the face and “Xander” stamped in the cavity with an oil can finish. The options are virtually endless. 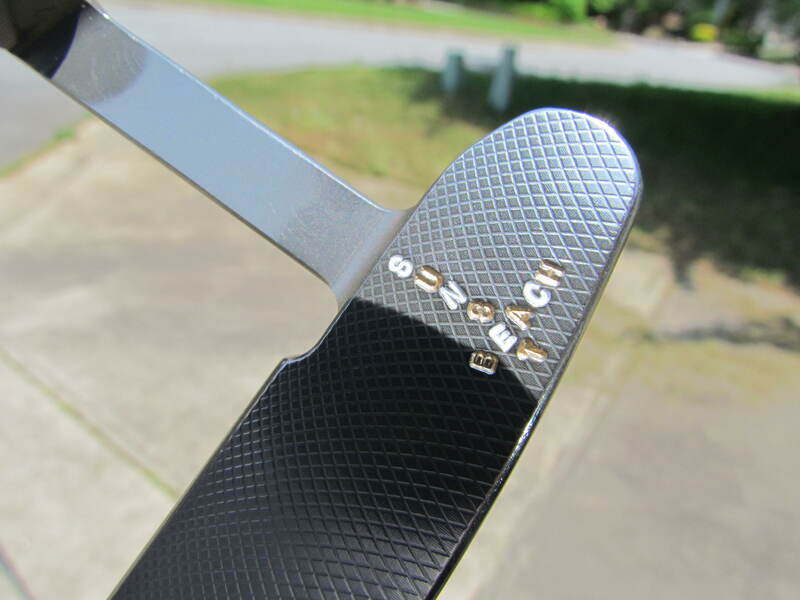 Unlike some of the more well-known putter makers, though, the cost will not break your bank. Ask Scotty Cameron to make you a custom putter to exactly your specs, and he’ll send you a bill for $5,000.00 (that’s right, five thousand). Plus, it’s likely he won’t give you all the stamping options you really want. 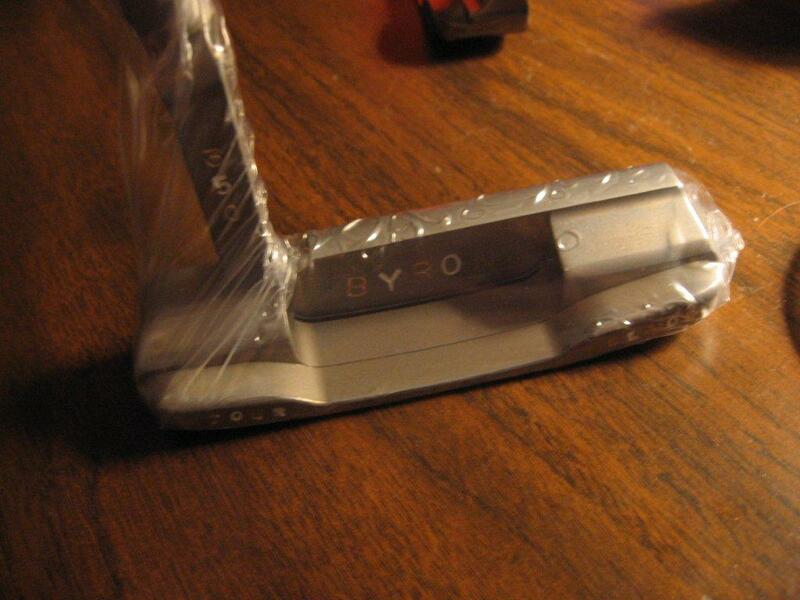 Byron will do almost anything you want (see http://www.golfwrx.com/forums/topic/208308-byron-morgan-library-of-photos/ for a listing of some of his custom putters). His 007 and 006 models start at $300; the DH-89 models start at $500. While this may seem like a lot to the typical Sunday golfer, consider the equipment you have in your bag. You pay almost $400 for a driver that you hit 14 or so times each round, max. Meanwhile, you’ll take at least 24 shots with your putter over the same round–and 24 would be a GREAT round. A good putter is a very important part of the game. Then, consider the other options out there. A Scotty Cameron off-the-rack is $300 without any customization; it’s not even bent to your preferred loft and lie options, and if you want something other than 33, 34, or 35 inches, better get the shop involved, which means extra money; and I hope you like 330 grams, because that’s all Scotty makes (unless you get one with removable weights in it). Meanwhile, you can get a Byron Morgan customized to look like what you want it to, at the length you want it to, at the weight you want it (that’s right, he’ll make it from 330 to 370 grams, no problem), milled to the loft and lie you want (not bent, like your Scotty–unless you happen to need the standard 71 lie angle and 4 loft of a Cameron), made out of the metal you want (Scotty gives you one option–which kind of means you don’t have an option), and made to the exact shaft length you want. Plus, they look darn cool! I was a bit skeptical at first. I thought they looked a little to hand-crafted. I thought they couldn’t really be as good as Scotty’s putters because…I mean, Scotty is endorsed by one of the best big companies, Titleist. He’s gotta be making the best, right? I am so happy I tried Byron’s putters. I’ve never owned another putter that gets the ball rolling so quickly as my 007 does. It’s weighted and balanced so much better than my Newport Beach was. It gives me exactly what I need from a putter–confidence. Moreover, the used market is not much different between Scotty’s putters and Byron’s. 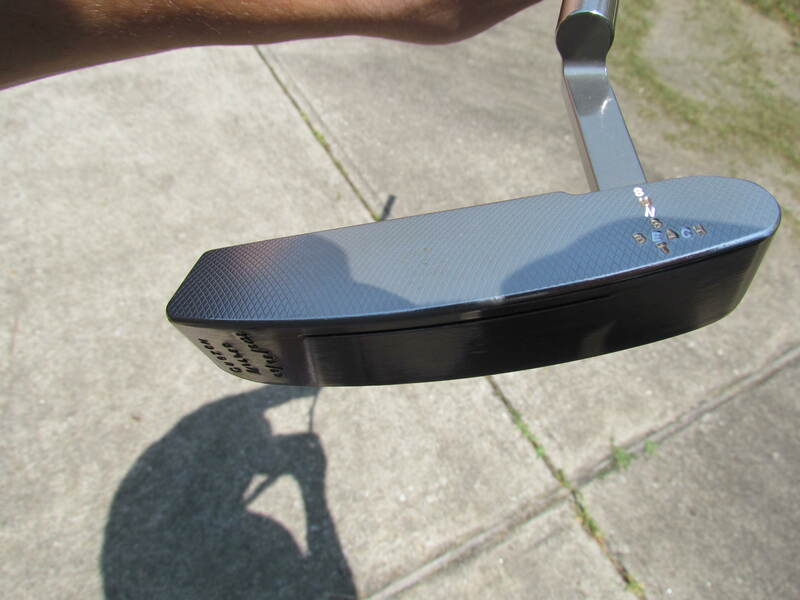 Obviously, you can find a Scotty Cameron on eBay for anywhere from $100 up to thousands–and, typically, a well-conditioned Byron Morgan putter is in the $200 range. But there are deals to be had. I’ve purchased Byron putters for $170 and $135 in very, very good condition. 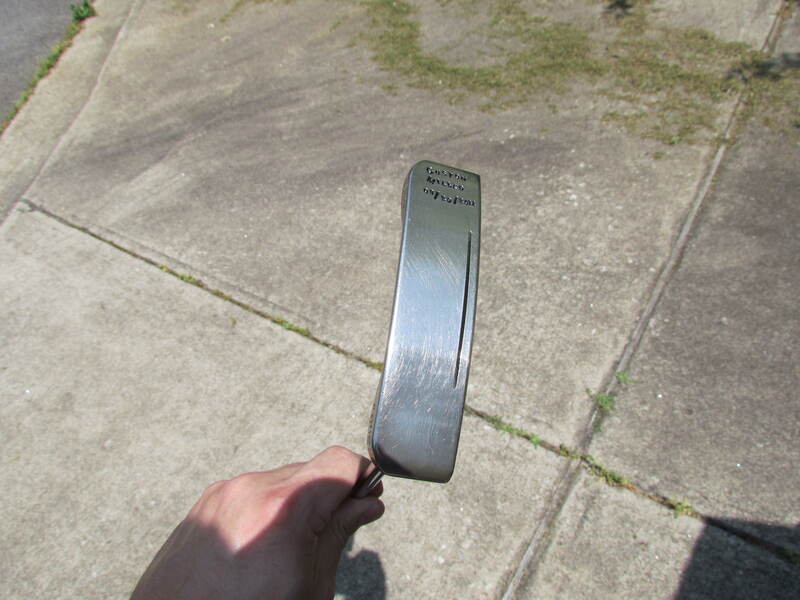 However, that leads me to the second aspect of why I love Byron Morgan putters. In addition to making an amazing product, Byron is unbelievably accessible. Try to get customer service with Scotty Cameron and I think you might find it difficult. 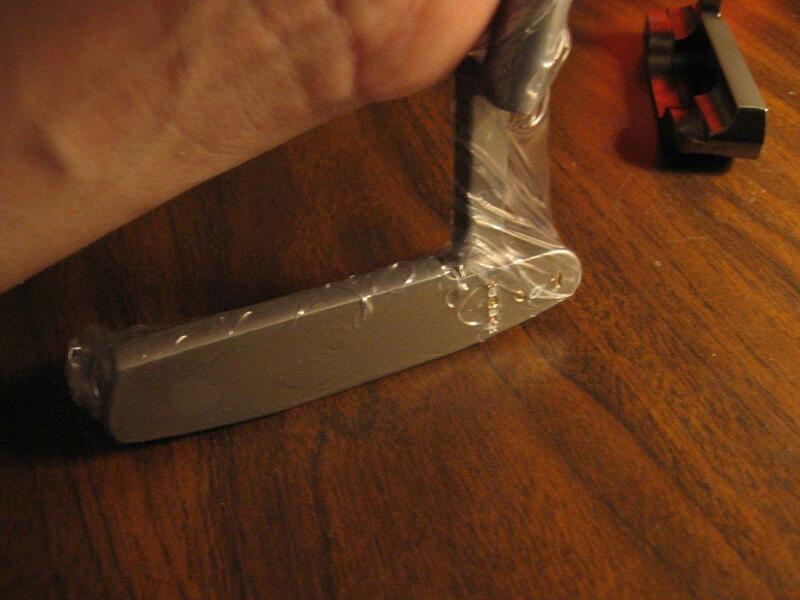 If you have a Cameron putter to send in for restoration, a staff member will email you and tell you what to do. And you’d better not have a lot of customization requests, because the Cameron shop will just ignore them and send you what they think you want. Meanwhile, I sent my current gamer in to Byron for work along with a letter stating what I wanted. Something didn’t work quite the way he thought it would, so, guess what? HE CALLED ME! Personally! I think my exact words were “I can’t believe I’m talking to you.” I spoke with him on the phone for about 20 minutes about what was going on with my putter in his shop as he worked on it by hand. He gave me a few ideas and told me what to expect. Amazing. Then, he called me again to tell me it was finished and even sent pictures to my email to let me know how it was going. In the end, I got about the closest thing I could to a custom putter. But that’s not all–I sent Byron the head by itself–in other words, with the shaft removed. Byron not only reshafted the putter for me with a new grip and a shaft, but he also replaced the paint fill–in custom colors that I asked for! All of this was included, and I didn’t even know it! Now, Byron’s work is not for everyone. I understand some people just need to have a name that other people recognize. 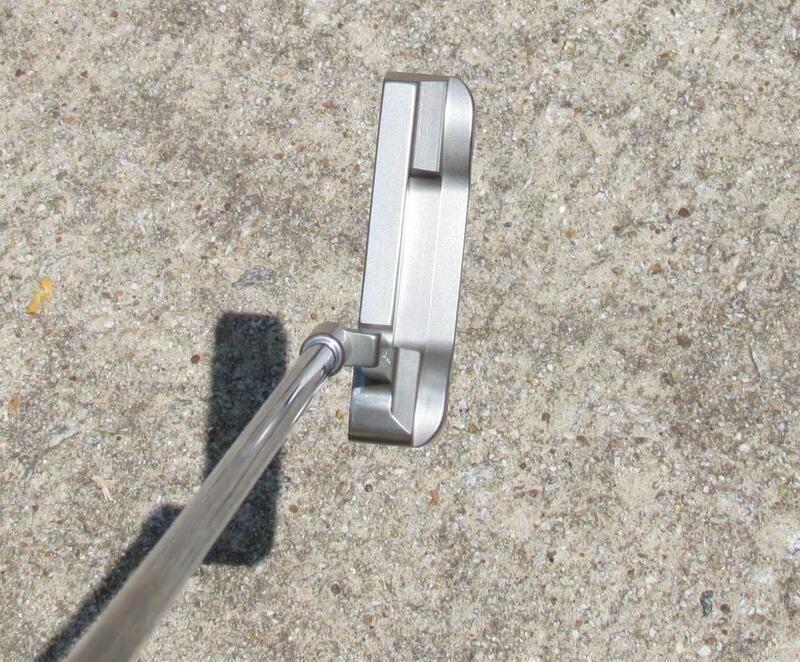 But the reason so many tour pros play the 009 from Cameron is that it is a high quality and custom made putter. Take the stamping off, and the Cameron 009 is totally indistinguishable from the DH-89. I have owned four Byron Morgans and I can say that, without a doubt, each one was better than any other putter I’ve ever played. So, with all my reviews, there has to be a downside section. This is hard to come up with. 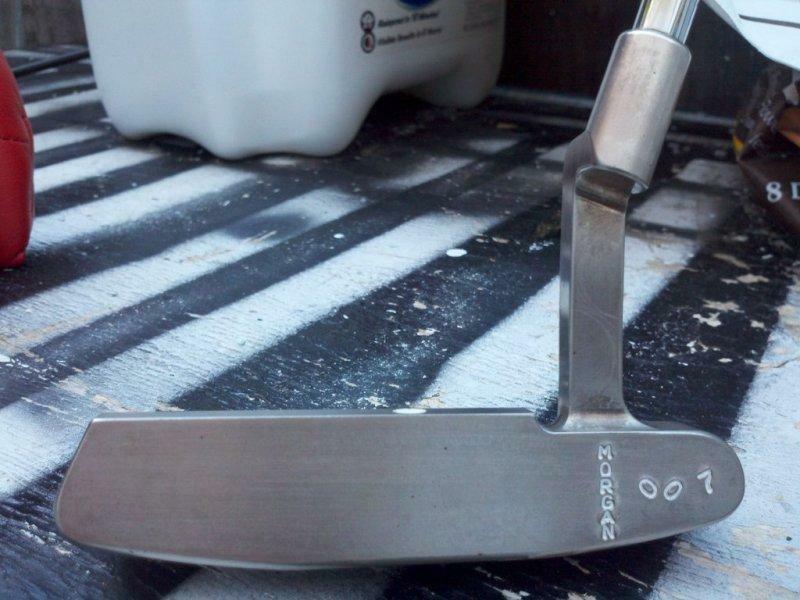 If you’re ordering a custom putter, the major downside is trying to figure out what you want. And, once you do make an order, it can take some time (2 months). 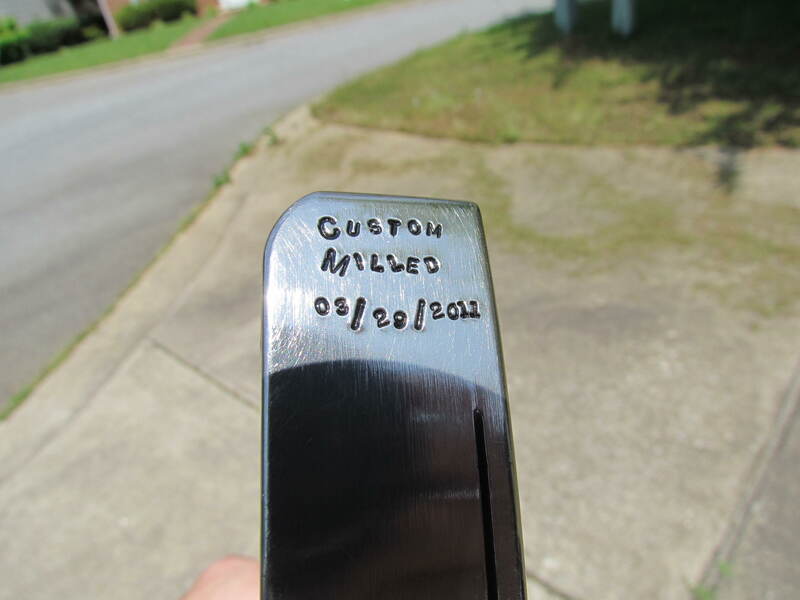 I’ve never experienced that, but almost certainly will one day when I have Byron make my custom putter. Availability is low since you typically can’t find them in a store, so you have to either buy one to try it or get involved with Byron’s demo program, which usually fills up the second it is released. However, that’s not really a downside because you can sell the things back for the same price you paid for them in almost every case. So, the most you’ll lose is the Paypal fees for selling them to someone else. BFD. It was a little difficult trying to figure out who to get in touch wtih and how to get in touch with them in order to get the work done. But, a little searching on GolfWRX or PutterTalk will get you in touch with Steve (Z-Man), who is Byron’s right-hand-man. Today’s post takes a look at one of the great finds of my golfing career: SMT Golf. I’m not sure exactly how I found SMT. I wish I could remember so I could tell you. However, what I CAN tell you is that I am very happy I found them. Anyone who has been to a big box store knows the frustration. You go to Golfsmith or PGA Tour Superstore or Edwin Watts; you try a bunch of drivers; most of them feel the same. You like one of them maybe a little more than the others; it’s priced at $399. You try to trade in your old one and get $40 or so on your trade. Two weeks later you see your old driver on the used rack for $150 and the one you just paid $399 is on clearance for $249. You spend the rest of your time with the club avoiding any possibility of scratching it or knicking it because you spent WAY too much money on it. It’s a frustrating experience that you only have to have once to be turned away. Hence, why I was looking for something more. What I found was SMT.